There is confusion these days due to the number of options and configurations being offered. Hopefully editing this post will clear up some of the confusion. There are no options in terms of surface finish such as bead blasted or anodized or stonewash. The clip which is standard on every light but the Sapphire is available in a couple forms beyond "stock". The diamond burr etched finish some call "cracked ice" is an additional $10 and/or the tapped 1/4"x20 hole version clip is an additional $5. Well into the realm of custom, I can and have built lights using specialized LEDs like red, Royalblue, IR and UV. Please don't order a light if you don't have the means of making payment in a timely fashion. Shipping and insurance: Shipping costs will be added and the total will be shown in the subject line of the E-mail you receive notifying you of shipment of the light. You can also request insurance coverage on the light which can be provided and added as an additional expense. The light becomes your property when I pass it on to the shipping agency of your choice. I prefer to ship via USPS but I can also ship via Fed EX. USPS Priority and Priority International are the default methods. For international shipments I do recommend EMS (Express Mail) for anyone uncertain as to the dependability of international priority mail. EMS is more expensive but does provide for a tracking number. There is no implied or express warranty on any of these lights. Should a problem or issue arise with a light, at my discretion I will seek an agreeable solution for all parties. These lights are at the leading edge of technology and often the R&D process is on going with the user part of the process. It may help to consider these lights a semi custom and experimental in nature. I have not denied a full refund for a returned light yet and don't forsee such a case but unless there is an obvious defect in a light, a return will be for a refund and not an exchange. I will to the best of my ability and knowledge provide information of all known issues regarding a light and hope that the user will be in a position of knowing what to expect of and from the light prior to ordering. At the time of writing this, LED tints and other types of artifacts are current topics. All LED's do have a tint and at some level of scrutiny, other artifacts as well. The user will hopefully be made aware of what to expect and not surprised by the light and its output. If user expectations are not met, the light can be returned for full refund. The return shipping will be at the user's expense and the refund will be made upon receipt of the returned light. The light belongs to the user until I have received it. There are levels of precision and finish which will always show irregularities and flaws. It has been my practice to specify tolerance levels in the parts I have machined such that form and function are achieved and held to dependable and expected performance and outcome. 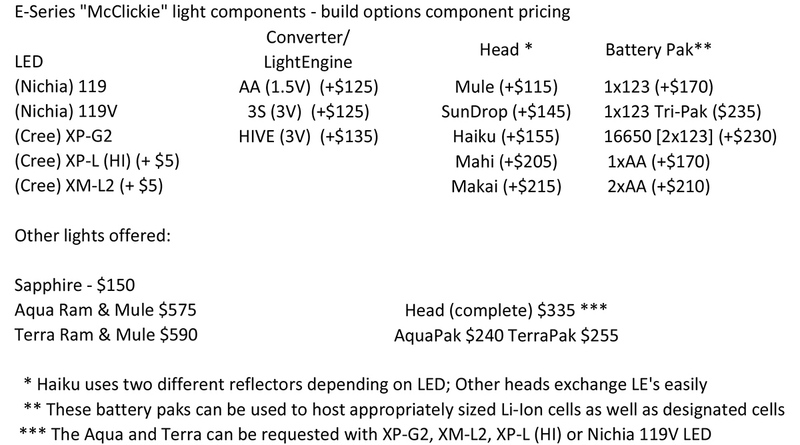 At an additional premium, I could strive for higher levels in finish and uniformity of the surface but I have elected not to increase the costs of these lights accordingly. In most if not all cases, toolng marks will be evident and the surfaces will not be free of blemishes or unique markings. Each light will be delivered with its own unique character mark. Should you find this not to be the case, feel free to impart your own mark to the light or return it and I will be happy to imprint it with an obvious and unique blemish or ding for you. These lights are expensive but that expense is not due to any attempt or claim of show case cosmetics or collectability. These lights are intended for use and abuse but it is ultimately for the user to decide. The LED's I use are also unique in signature and they will have a tint of some sort. If specific bin information is provided, this will be information as provided to me by the LED manufacturer and it too is subject to variation or so the case has been so far. If specific bin information is provided this is not to be construed that bin options also exist. Please note that the offered builds are limited to Current Links of offerings as noted above. I will keep this updated as changes arise. I won't build a light with a customer provided LED because if there is any problem, I wouldn't have a replacement LED. I don't want to discuss bin options, my opinion of tint differences or any other bin considerations in e-mails. I will refer any such e-mail to THIS thread where bin differences can be discussed. I am really sorry but I am uncomfortable in providing subjective personal opinions to someone trying to decide what build they want; especially when I consider most differences to be below any threshold of real significance. With the current diversity and number of wave offerings I realize this gets confusing for all of us!! I try to keep it simple and straight forward but there are a bunch of possible combinations not necessarily identified in the various wave offerings. If you seek a combination of head, pack and LE not offered but viable, please ask about it in one of the related threads. I have run into a problem which presently limits my offerings considerably!! I am moving into a new version of the 3S converter which is the back bone driver for my single cell offerings. I have been using a prototype for a number of months and it has some nice improvements over the present 3S converter. Namely the PWM is such that I can't see any indication of PWM in low or medium nor do I suspect others will detect it either. Additionally the converter is more forgiving on depleted batteries in allowing one to continue to shift through the three levels of output. I ran out of the current version of the 3S converters last week and this weekend started building using the new version. Most unfortunately though, I discovered a glitch in the production converters! There is an instability in holding the constant current to the LED as the Vf of the LED changes (temperature). In passing this info back to the designer in Japan it seems that the solution is there in a program change to the control chip on the converters. That's the hopeful news but the bad news is that these new version converters will have to be shipped back to Japan for reprogramming and in the mean time (no idea how long this is) I am unable to build or offer any lights with a 3S converter. I had hoped for a clean and painless transition from one version of the 3S converter to a new and improved version but so much for that plan. I received re-programmed converters back from Japan yesterday so am now in a position to build and offer these lights with the new version of 3S converters. I put a notification in the initial post above about a temporary out of stock situation with the 1x123 McClickie paks. I received a partial shipment of the 1x123 McClickie paks so I can now continue with the current offerings. the Mahi head as well as made note that there are now 16650 Li-Ion batteries which can be used in the 2x123 paks.